'Celebrate Mother's Day in 'Swiss Style' with Gilda from Eberhard & Co.
Dubai, UAE, February 25, 2018: Eberhard & Co., historic watchmaking company with a strong masculine identity, makes a turn towards “Her” and is pleased to present Gilda, the new “feminine” wristwatch of the Maison. Authentic and with a multifaceted character, the Gilda collection celebrates and embodies the elegance and initiative of today’s woman. An harmonious union of modernity and tradition, accentuated by the soft lines of its 18 ct. red gold elliptical case and the choice of materials, expresses both a contemporary, self-assured character and a refined, delicate soul. Animated by a quartz movement, truly versatile in the combinations with the various dial options in mother-of-pearl or with a refined application of brilliants, embellished with elongated leaf-shaped hands surrounded by Roman numerals, and protected by a spherical, domed sapphire crystal with anti-reflective treatment, Gilda is the new expression of the enchanting femininity of the Eberhard & Co. Lady. The polished case back secured by 4 concealed screws, is enhanced with a delicate floral motif. Completed with either an alligator strap and personalized “E&Co.” buckle, or the Ch�ri® gold bracelet with a personalized “E&Co.” deployment clasp, Gilda gently fits the shape of the wrist in an expert game of aesthetics and design, offering a subtle balance between the technical and the material. 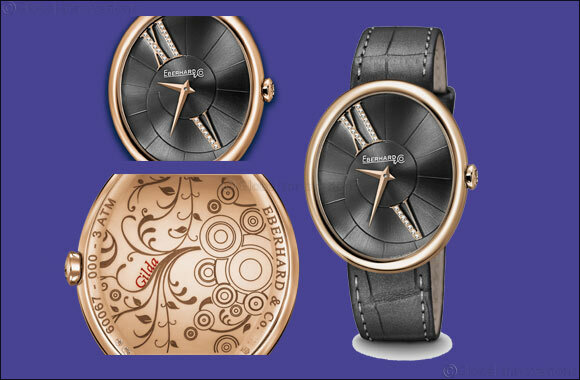 Voil� la nouvelle Femme by Eberhard & Co.: Gilda, the fascination of an entirely feminine world! Case-back: polished, fixed by 4 concealed screws, engravings of a delicate floral design and model’s name in red. pearl grey satin with black or treatment, “coquille” version with diamond-set V and XI numerals. Hands: leaf-shaped, black dauphine type for “coquille” dials. Elliptical buckle personalized Eberhard & Co.